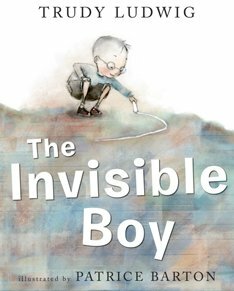 The Invisible Boy by Trudy Ludwig (Alfred A. Knopf Books for Young Readers, $16.99, Ages 6-9), with illustrations by Patrice Barton, is reviewed by Ronna Mandel. The Invisible Boy by Trudy Ludwig with illustrations by Patrice Barton, Alfred A. Knopf Books for Young Readers, 2013. Parents, how many times have you volunteered in your child’s school and noticed an invisible boy? They’re not easy to see, I know. Like Brian, the main character in Ludwig’s touching and thoughtfully written new picture book, The Invisible Boy, they fly under the radar in schools all over the world. Illustrator Barton’s drawn Brian in muted grays and white although everyone else is in color. Unlike Brian’s imaginative artwork (wonderfully rendered in kid-style by Barton) depicting Super Brian, he’s not a superhero “with the power to make friends” wherever he goes. Nope. Kids like Brian are the last ones chosen for sports teams, they don’t get invited to parties, in fact other kids don’t even think of the Brians as having feelings. They’re often overlooked in the classroom because they’re quiet and so well-behaved. Typically the teacher has to devote his or her time to dealing with the whiners and the yellers. And while Brian may frequently get ignored, he’s smart. So smart that he puts a note in the cubby of new boy Justin, with a drawing of himself eating Bulgogi, “Yum!” The two boys hit it off at recess, but it’s clear Justin’s already made another friend, Emilio, who says it’s his turn to play tetherball. But Justin is kind and doesn’t leave to play with Emilio without first complimenting Brian’s artwork. When Brian wants to partner with Justin on a special project, Emilio holds Justin back. “I’m already with Justin,” says Emilio. “Find someone else.” I could feel my grin spreading when the image of Brian begins to shift from grays and white to greens and blues when Justin tells him the teacher says the special project group can have three people in it. As the friendship grows, and Emilio accepts Brian, too, a once lonely boy becomes visibly happy and colorful. The Invisible Boy includes important back matter with questions for discussion that parents and teachers can use to prompt kids about the topic of bullying. There’s also recommended reading for adults and kids. With bullying being so prominent in the news, it’s great to have a resource like The Invisible Boy to enlighten youngsters about the pain and heartache of being ignored or ostracized.